In October 2017, 14-year-old Kejuan Franklin was suspended from Rowe Middle School for an off-campus incident that nobody could verify. After a hearing that had no witness testimony, no person representing his interests, nor even his mother's knowledge that it was taking place, Kejuan was expelled. 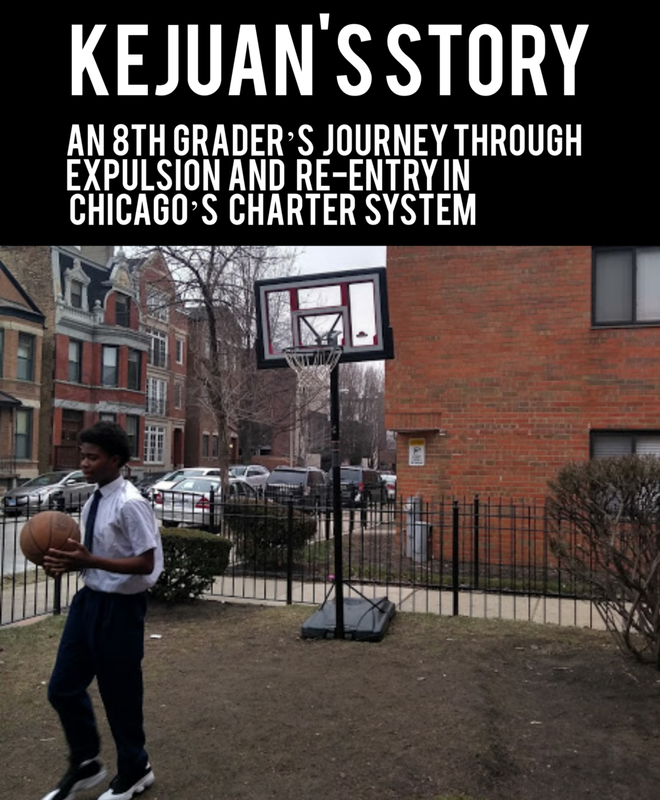 Placed in an alternative school 15 miles away without adequate transportation, Kejuan wound up missing around 30 days of school before attorneys with Chicago Lawyers’ Committee were able to negotiate his return to Rowe. Sitting on her long gray sofa six months later, Kejuan’s mother Dennisha recalls her anger when she realized that her son’s future was in danger. “I’m going to do anything to protect my child,” says Dennisha. Dennisha is a single mother who lived in Humboldt Park for thirteen years before moving to the north side. She was only 15 years old when she became pregnant with Kejuan, and with support from her grandmother she worked diligently to complete her high school diploma. Today, she has three other children who roam happily from room to room: 11-year-old Amanda, 9-year-old Kira, and 4-year-old Troy. Together, the family lives in a simple subsidized home in west Lincoln Park. One of the draws to the area was the family’s access to a quality school nearby: Rowe Elementary, a K-8 Charter School. According to Kejuan, the trouble at Rowe started on Friday, September 29, when he was walking after school with classmates to pick up his little sister from the elementary school campus of Rowe. He and another girl were teasing each other, and in the tussle they spotted a pocket knife. Kejuan says he picked up the knife and tossed it in a nearby sewer; the girl said he used it to threaten her for her phone. When Kejuan returned to school on Monday morning, he was suspended out of school for three days. Then, the school conducted an expulsion hearing - without his presence. Dennisha didn’t receive advance notice about the hearing, so she was only able to join at the last minute by phone and had no time to consult with outside counsel. Without a witness to verify what happened, the Hearing Officer and Principal recommended to the Board that Kejuan should be expelled for the rest of the school year. The Board President of Northwestern Settlement, which runs the charter, affirmed the decision. Kejuan Franklin and his mother, Dennisha Franklin, outside their home six months after Kejuan's expulsion. Things got worse after the expulsion. Charter schools have a separate process from other Chicago Public Schools, yet it fell to Chicago Public Schools (CPS) to provide a list of alternatives for Kejuan. While she waited for clarity from CPS, her son racked up more absences, and Dennisha had to figure out care for him at home. She checked with multiple schools, only to find he wouldn’t be allowed to enroll. Finally, she received the name of an alternative “Safe School” where Kejuan would be accepted: Camelot Academy, located almost fifteen miles away in South Shore. Because he was a middle schooler, Kejuan was able to secure bus transportation from CPS - but it was constantly late picking him up. At Camelot, students were not allowed to bring water to school or go outside. There were no textbooks or homework assignments. Kejuan recalls that the “classwork” was either watching movies or reading at a 4th grade level, even though the students were mostly older than him. As the weeks passed by, Kejuan became depressed. He wanted to learn, but the school was not providing meaningful education for him. In the meantime, Dennisha had learned through Equip for Equality that there was help available at Chicago Lawyers’ Committee for Civil Rights. She contacted Staff Attorney Jessica Schneider with the Education Equity Project, and together with former Staff Attorney Aditi Singh, now of Chicago Appleseed, they began working on a complaint and a motion for injunctive relief from the circuit court. They knew it was imperative to get Kejuan out of Camelot and into a more suitable learning environment as soon as possible. There are alternatives to expulsion that can teach behavior and provide the support Kejuan and his family need. More than two months after Kejuan’s expulsion, Jessica was finally able to negotiate a settlement with Rowe’s attorneys to return Kejuan to school in a manner that satisfied everyone, and put plans in place recognizing that Kejuan could succeed at Rowe. Schools often create safety plans, and reentry plans are now required by the Illinois School Code for students returning from suspension, expulsion, or alternative school transfers. In January, Kejuan was finally back at Rowe to start the new semester and graduate eighth grade. Today, Kejuan says he is bringing his grades up and doing his best to avoid trouble. The lingering effects of the expulsion remain, and there are still some restrictions on his activities. It has not been easy for him to escape being labeled as a safety threat. He never imagined he would end up in a situation where he was unable to attend a good school. Now, Kejuan is working hard to make up for the lost class time and is happy to be learning. His goal, he says, is to become an engineer. “When schools play fast and loose with exclusionary discipline, they are gambling with the futures of at-risk young people,” reflects Staff Attorney Jessica Schneider.